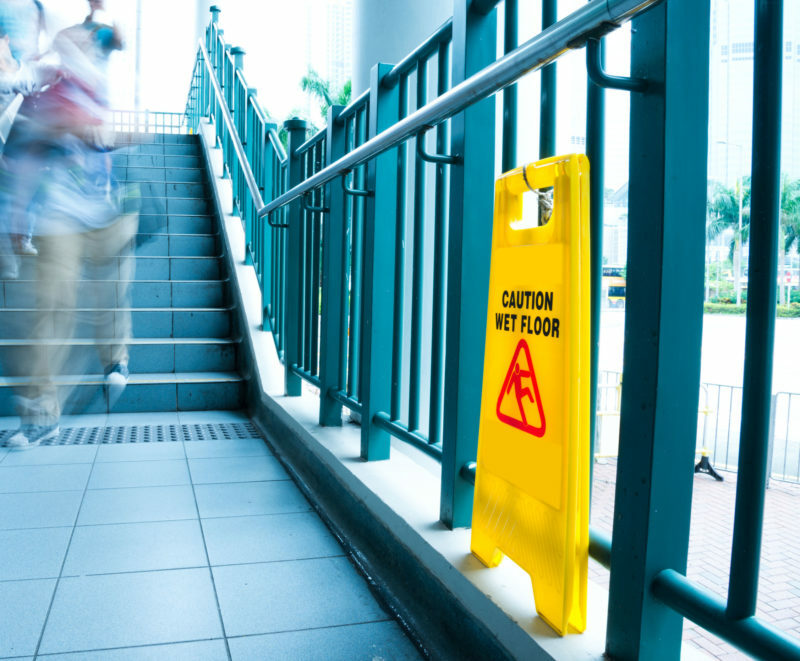 Public Liability Insurance - why does your business need it? 35184500 - wet floor caution sign near the stairs. Generally speaking insurance is there to provide the insured party with a sense of protection or ‘peace of mind’. Insurance is not a physical thing – which may explain why it is often considered a grudge purchase. When public liability insurance is purchased you will receive your policy documentation either electronically or via post but why is it so important? If in the unfortunate event you are faced with a claim, you may consider public liability insurance to be amongst one of the best purchases you have made as a business. Public liability insurance is not mandatory for the majority of businesses in the UK – therefore you may question why you need it in the first place. Surely if you do not require it by law, then it ‘can’t be that important’? Unfortunately the fact it is mostly a voluntary insurance and not required by law will not help you if a successful claim is upheld against your business. Accidents can and do happen, and it is this ‘risk’ that prompts businesses to take out cover. The majority of accidents are unpredictable, unavoidable and without cover your business could be left financially liable. Public liability insurance can provide financial protection for unfortunate incidents including accidental damage to property and personal injury as a result of your business activities or operations. You are a painter and decorator. You are up a ladder paining the higher end of a wall. The vibrant red paint tin falls onto a customer’s cream carpet which you had not covered. In this instance the property owner would likely claim against you for the cost of either cleaning, or the price of a new, fitted carpet. All being well within the terms of your policy, your public liability insurance would cover the costs of cleaning/replacing the carpet. You are a painter and decorator. You are up a ladder paining the higher end of the wall. You leave for lunch with your ladders still set up in the room with the paint tin at the top. The customer walks past the ladder and the tin falls onto their head resulting in concussion and the paint spills onto their carpet. Again, all being well within the terms of your policy, your public liability insurance would cover the cost of any compensation and damages awarded. No matter how careful you, your employees and your customers may be, accidents can still happen and whether you are insured or not, you could still be held financially liable. Therefore you may want to ask yourself whether or not you could afford to pay your customer for a ‘brand new carpet’ or pay out potentially thousands in personal injury compensation. Specialising in the trade and construction industry, we are aware that the risk of injuries or property damage is considerably high. At constructaquote.com we aim to provide public liability insurance policies that will offer you reassurance if you’re ever faced with a claim.